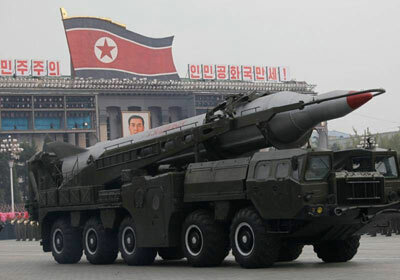 The North Korean Hwasong-7, also known as Nodong (or Scud-D), missile is a North Korean development of the Scud technology. It has a potential range of 1000 - 1300 km with a 700-1,000 kg. Flight tests began in 1990 with a first successful flight in 1992. Since then, the missile has been included into the North Korean weapons inventory. The Nodong designator is a western designation. The North Korean name of the missile is not known. The Nodong missile technology has been exported to a number of countries and resulted likely in the Pakistani Ghauri and the Iranian Shahab-3 missiles and the Iranian space launch vehicle Safir.